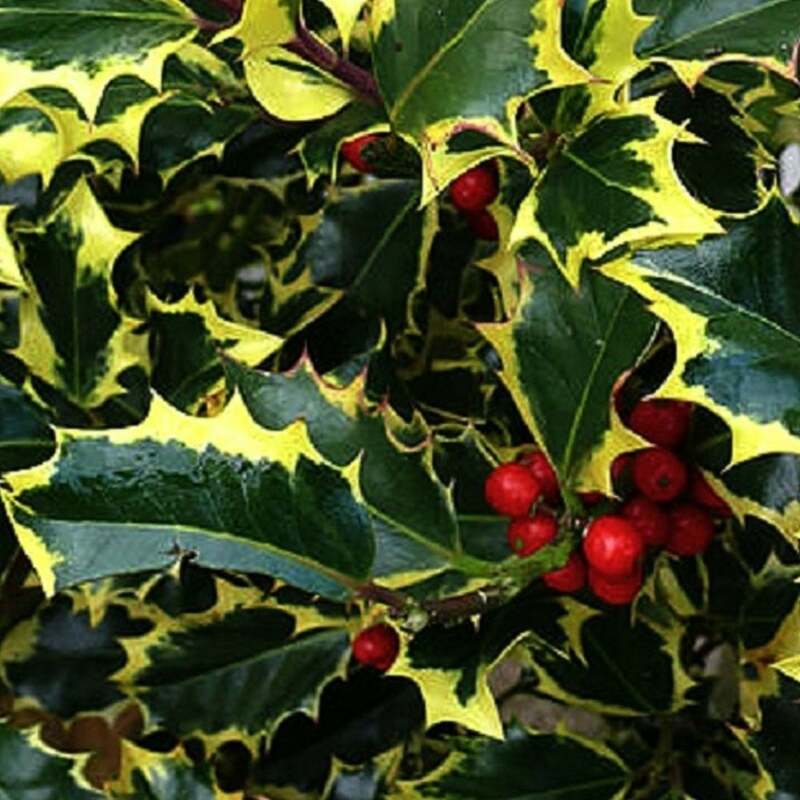 Characteristics: Evergreen Holly with spiky dark-green leaves and bright red berries through autumn and winter. Flowering: Small white flowers in spring. Height and Spread in 20 years: 12m / 8m. Can be grown as a tree or shrub. Hardiness and Best Position: Frost hardy to -15°C. Suited for sun, partial shade and shade. Soil: Tolerant of any soil type. If you love Hollies, the Ilex aquifolium 'Madame Briot' is another classic variation to add to your garden. It features dark green foliage with spiny edges that are trimmed with a golden yellow border. The tree is evergreen, ensuring colour in your garden all year round. In spring it offers small white flowers and in autumn it becomes a joy to behold, laden with bright red berries that deepen to a rich red and remain on the branches throughout the winter. This Holly is a female plant and requires a male partner nearby to pollinate it in order to produce berries. Madame Briot is a hardy plant that can withstand cold temperatures down to -15°C. It can thrive in sun, partial shade or shade, making it a great choice to plant in an area under a large tree where little else will grow. The Holly is tolerant of most soil types and is also tolerant of exposure and coastal positions. Hollies make great festive decorations for the Christmas season. They also add colour and interest to your garden all year round. Hollies are easy to maintain, requiring minimal time, making them the ideal choice for busy people who want variety in their garden. They can be grown as a focal point near an entrance way or planted in a dull corner to add colour. They also make excellent hedging and screening. The red berries attract birds into your garden, adding movement and sound to the natural ambience of your special space.